The 1962 FIFA World Cup was the seventh FIFA World Cup, the quadrennial international football championship for men's national teams. It was held from 30 May to 17 June 1962 in Chile. The qualification rounds took place between August 1960 and December 1961, with 56 teams entering from six confederations, and fourteen qualifying for the finals tournament alongside Chile, the hosts, and Brazil, the defending champions. Brazil successfully defended their World Cup title, defeating Czechoslovakia 3–1 in the final in the Chilean capital of Santiago. They became the second team, after Italy in 1934 and 1938, to win the World Cup twice in succession; no team has achieved the feat since. Host nation Chile finished third, defeating Yugoslavia 1–0 in the third-place play-off. The tournament was marred by a toxic atmosphere and violence between players on the pitch; it included the first-round match between Chile and Italy (2–0), which became known as the Battle of Santiago, one of a number of violent matches played throughout the tournament. It was the first World Cup that used goal average as a means of separating teams with the same number of points. It was also the first World Cup in which the average number of goals per match was less than three (2.78); this has been repeated at every World Cup since, despite expansion of the tournament. After Europe hosted two consecutive World Cups, the American federations claimed the 1962 edition must be held in South America or face a complete boycott of the tournament, similar to 1938. Argentina, after previously failed candidacies, was the favorite. Magallanes' chairman, Ernesto Alvear, attended a FIFA Congress held in Helsinki while the Finnish city was hosting the 1952 Summer Olympics. He considered that Chile was able to organise the World Cup. Several sources also say that FIFA did not want Argentina to run alone, requesting the participation of Chile as almost symbolic. Chile registered its candidacy in 1954 alongside Argentina and West Germany, the latter withdrawing at the request of FIFA. Chile's football federation committee, led by Carlos Dittborn and Juan Pinto Durán, toured many countries convincing various football associations about the country's ability to organise the tournament in comparison to Argentina's superior sports infrastructure and prestige. The FIFA Congress met in Lisbon, Portugal on 10 June 1956. That day, Raul Colombo, representing Argentina's candidacy, ended his speech with the phrase "We can start the World Cup tomorrow. We have it all." The next day, Dittborn presented four arguments that supported Chile's candidacy: Chile's continued participations at FIFA-organised conferences and tournaments, sports climate, tolerance of race and creed and political and institutional stability of the country. In addition, Dittborn invoked Article 2 of the FIFA statutes that addressed the tournament's role in promoting the sport in countries deemed "underdeveloped". Chile won 31 votes to Argentina's 12. Thirteen members abstained from voting. 57 teams entered the 1962 World Cup (due to rejected entries and withdrawals, 52 teams eventually participated in the qualifying stages). Chile as host nation and Brazil as reigning World Cup champions were granted automatic qualification, with the remaining 14 finals places divided among the continental confederations. Eight places were contested by UEFA teams (Europe) and three by CONMEBOL teams (South America). CAF teams (Africa), AFC teams (Asia), NAFC teams (North America), and CCCF teams (Central America and Caribbean) contested three play-offs slots. The three winners would then face a European or South American team for entry into the World Cup. The 1962 tournament was the last one for which only nations from Europe or the Americas qualified. Two teams qualified for the first time ever: Colombia and Bulgaria. Colombia would not qualify for another World Cup until 1990. Among the teams who failed to qualify were 1958 runners up Sweden and 1958 third-place finishers France. Austria withdrew during the qualification tournament. Originally, eight stadiums were selected to host the World Cup matches in eight cities: Santiago, Viña del Mar, Rancagua, Arica, Talca, Concepción, Talcahuano and Valdivia. The Valdivia earthquake, the most powerful earthquake ever recorded, occurred on 22 May 1960. With over 50,000 casualties and more than 2 million people affected, the earthquake forced the organising committee to completely modify the World Cup's calendar. Talca, Concepción, Talcahuano and Valdivia were severely damaged and discarded as venues. Antofagasta and Valparaíso declined to host any matches as their venues were not financially self-sustainable. Viña del Mar and Arica managed to rebuild their stadiums while Braden Copper Company, then an American company that controlled the El Teniente copper mine, allowed the use of its stadium in Rancagua. 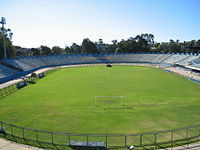 The most used stadium was the Estadio Nacional in Santiago, with 10 matches; the Estadio Sausalito in Viña del Mar hosted 8 matches, and the stadiums in Rancagua and far-away Arica (the only location that was not close to the other cities) both hosted 7 matches. Being largely concerned with the build-up of the country after the 1960 earthquake, government support for the tournament was minimal. Squads for the 1962 World Cup consisted of 22 players, as for the previous tournament in 1958. After Attilio Demaría and Luis Monti, who both represented Argentina in 1930 and Italy in 1934, Ferenc Puskás (Hungary in 1954, then Spain), José Santamaría (Uruguay in 1954, then Spain) and José Altafini (Brazil in 1958, then Italy) became the third, fourth and fifth players to play for two national teams in the World Cup. In light of this, FIFA created stipulations describing that once a player represents a nation during a World Cup or its qualifying rounds the player cannot switch to another national team. Robert Prosinečki and Robert Jarni would later become the sixth and seventh such players, playing for Yugoslavia in 1990, then for Croatia in 1998; Davor Šuker was also selected in both squads, but did not play in 1990. This was accepted by FIFA because Croatia was a newly independent former republic of Yugoslavia. Eighteen match officials from 17 countries were assigned to the tournament to serve as referees and assistant referees. The format of the competition was similar to that of the 1958 competition: 16 teams qualified, divided into four groups of four. Four teams were seeded in the draw taking place in Santiago de Chile, on 18 January 1962: Brazil, England, Italy and Uruguay. The top two teams in each group advanced to the quarter-finals. Two points were awarded for a win and one for a draw. In a change from the 1958 format, goal average was used to separate any teams equal on points. (In 1958, goal average was available, but was only between teams level on points in first place, or if a playoff between teams equal in second place failed to yield a result after extra time). Argentina became the first (and only) team in World Cup history to be eliminated on goal average when England advanced from Group 4 in second place. In the knockout games, if the teams were level after ninety minutes, thirty minutes of extra time were played. For any match other than the final, if the teams were still even after extra time then lots would be drawn to determine the winner. The final would have been replayed if still tied after extra time. In the event, no replays or drawing of lots was necessary. In May 1960, as the preparations were well under way, Chile suffered the largest earthquake ever recorded (9.5 magnitude), which caused enormous damage to the national infrastructure. In the face of this, Carlos Dittborn, the president of the Organization Committee, coined the phrase "Because we don't have anything, we will do everything in our power to rebuild". Stadia and other infrastructure were rebuilt at record speed and the tournament occurred on schedule with no major organisational flaw. Dittborn did not live to see the success of his efforts, as he died one month before the start of the tournament. The World Cup venue at Arica was named Estadio Carlos Dittborn in his honour and bears his name to this day. Even with these few and low-capacity stadiums Chile was able to meet the demand for seats as international travel to Chile, far-away for Europe, was minimal at the time. President Jorge Alessandri gave an uninspiring inaugural speech before the first match, which was played between Chile and Switzerland. Alessandri left however before the end of the match. While Chilean society was living in a "footballized" atmosphere, Alessandri was criticized for his cold attitude towards the tournament, which forced his ministers to come out and claim he was as "footballized" as everybody else, but was too busy to devote too much attention to the competition. Official 1962 FIFA World Cup poster. The competition was marred by constant violence on the pitch. This poisonous atmosphere culminated in the first-round match between host Chile and Italy (2–0), known as the Battle of Santiago. Two Italian journalists had written unflattering articles about the host country and its capital city; describing Santiago as a "proudly backwards and poverty-stricken dump full of prostitution and crime". Although only two players (both of them Italian) were sent off by the English referee Ken Aston, the match saw repeated attempts from players on both sides to harm opponents, and the Italian team needed police protection to leave the field in safety. Articles in the Italian papers La Nazione and Corriere della Sera were saying that allowing Chile to host the World Cup was "pure madness"; this was used and magnified by local newspapers to inflame the Chilean population. The British newspaper the Daily Express wrote "The tournament shows every sign of developing into a violent bloodbath. Reports read like battlefront despatches; the Italy vs West Germany match was described as 'wrestling and warfare'". As the competition began, a shift in strategy was imminent. Defensive strategies began to take hold as the average goals per match dropped to 2.78, under 3 for the first time in competition history (the average has never been above 3 since). Pelé was injured in the second group match against Czechoslovakia. The USSR's goalkeeper Lev Yashin, arguably the world's best at the time, was in poor form and his team went out to Chile (1–2) in the quarter-finals. Bright spots included the emergence of the young Brazilians Amarildo (standing in for Pelé) and Garrincha, the heroics of Czechoslovakia goalkeeper Viliam Schrojf against Hungary and Yugoslavia, and the performance of the host nation Chile, who took third place with a squad of relatively unknown players. In the first round, Brazil topped their group with Czechoslovakia finishing second, above Mexico and Spain. USSR and Yugoslavia finished above Uruguay and Colombia. Hungary, along with England progressed to the quarter-finals, while Argentina and Bulgaria were eliminated. England had the same number of points as Argentina but progressed due to a superior goal average; the first time such a requirement had been necessary in a World Cup finals tournament. Switzerland lost all three games while West Germany and Chile both went through over Italy. Brazil national football team in the World Cup, 1962. National Archives of Brazil. Chile defeated European champions USSR to earn a semi-final game against the winner of the England – Brazil game. Garrincha scored two goals in a 3–1 win against England. Meanwhile, 1–0 wins for Yugoslavia against West Germany – and another 1–0 win of Czechoslovakia against neighbours Hungary – saw the two Slavic states meet in the semi-finals. Viña del Mar was the original venue for the South American semi-final and Santiago for the Slavic one, but due to Chile's surprise qualification, the organisers prompted FIFA to switch the venues. This irritated crowds in Viña del Mar and only a little under 6,000 spectators came to Estadio Sausalito to watch Czechoslovakia beat Yugoslavia 3–1, whereas a capacity crowd of 76,600 in Santiago watched Brazil beat the hosts 4–2. This game saw Garrincha sent off for Brazil and Honorino Landa sent off for Chile. Chile eventually took third place in a 1–0 victory over Yugoslavia with the very last play of the match. The same player, Eladio Rojas, had also scored the winning goal in Chile's game against USSR. Santiago's Estadio Nacional served as the venue for the final, and after 15 minutes, Brazil again found themselves a goal behind in the World Cup final, as a long ball from Adolf Scherer was latched onto by Josef Masopust: 1–0 Czechoslovakia. As in the previous final in 1958, Brazil soon hit back, equalising two minutes later through Amarildo after an error by Czechoslovak goalkeeper Schroijf. The Brazilians scored goals from Zito and Vavá (another Schrojf error) midway through the second half, and the Czechoslovaks could not get back into the game. The match ended 3–1 to Brazil, a successful defence of the title for only the second time in the history of the competition in spite of the absence of one of their star players of 1958, Pelé, who was replaced by Amarildo. England finished ahead of Argentina on goal average. With four goals each, Flórián Albert, Garrincha, Valentin Ivanov, Dražan Jerković, Leonel Sánchez and Vavá were the top scorers in the tournament. In total, 89 goals were scored by 54 players, with none of them credited as own goal. ^ a b "FIFA World Cup 1962 – Historical Football Kits". Historicalkits.co.uk. Retrieved 29 June 2014. ^ Paul (16 December 2012). "Carlos Dittborn Pinto – 1962 FIFA World Cup". DoFooty.com. Retrieved 15 June 2014. ^ "for the first time goal average was brought in as a means of separating teams with the same amount of points" "Compact book of the World Cup" (PDF). Archived from the original (PDF) on 30 December 2013. ^ Brewin, John; Williamson, Martin (30 April 2014). "World Cup History: 1962". ESPN FC. ESPN Internet Ventures. Retrieved 12 June 2015. ^ Lopresti, Sam (28 February 2014). "Italy World Cup Rewind: Infamy at the Battle of Santiago, 1962". Bleacher Report. Retrieved 15 June 2014. ^ "FIFA World Cup Record – Organisation". FIFA. Retrieved 15 June 2014. ^ Grüne, Hardy (2006). "WM 1962 Chile". Fussball WM Enzyklopädie 1930–2006. Agon Sportverlag. ISBN 978-3-89784-261-8. ^ RSSSF credits this goal to Georgi Asparuhov. Wikimedia Commons has media related to FIFA World Cup 1962.